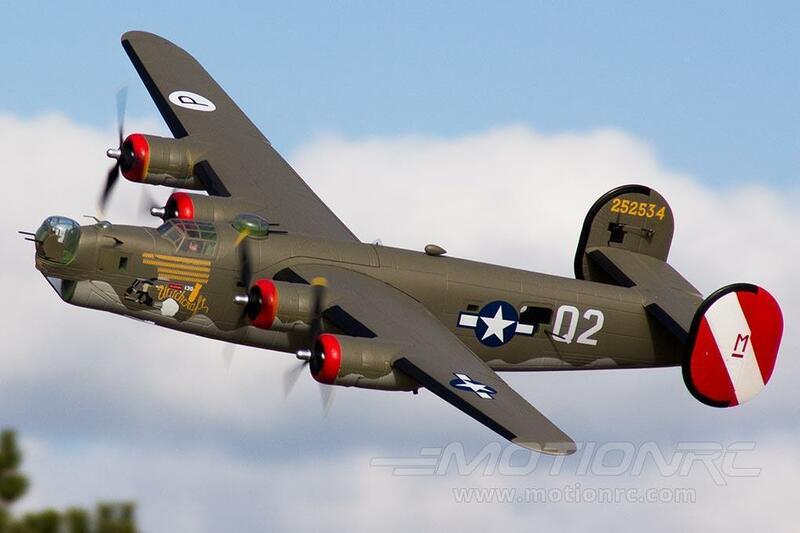 The famed B-24 Liberator is one of the most recognizable WWII aircraft of all time. Serving in every theater of that global conflict, the B-24 fought to bring its brave crews home through unimaginable danger. With humility and reverence, Xtreme Hobby is proud to introduce the world’s first foam electric PNP B-24 Liberator into our collection, in remembrance of the crews who gave the ultimate sacrifice and those who carry on its memory. The FlightLine RC B-24 Liberator is approximately 1/16.7 scale, with a 2000mm wingspan and 1230mm length, and is constructed from EPO foam and reinforced with integrated aluminum, carbon fiber, plywood, and plastic structures. Designed with input from the Collings Foundation, which operates the only flying B-24-J, “Witchcraft”. Due to the many configurations of the real B-24, the model features modular design to allow each modeler to customize his/her model further. A magnetic nose section allows owners to quickly swap between B-24 variants, the -D (“Greenhouse” nose), and the -J (“Emerson turret” nose), and the Upper Turret on both variants and the Nose Turret on the -J variant can be panned with an optional 9g servo. Steerable tillers are pre-installed, including special provisions to fit FPV cameras in the nose with minimal modification. An internal wooden spine reinforces the bomb bay area, if a modeler chooses to install operating doors. An all new pilot figure sculpt depicts period accurate A-2 crew jacket, radio headset, and iconic “crusher” cap and insignia. The FlightLine RC B-24 uses four 3530-860kv brushless outrunner motors, 30A ESCs, 9.5 x 7 counter-rotating propellers, and a separate 5A UBEC. The recommended pair of 4s 14.8v 3000-4000mAh lipo batteries can power the aircraft in excess of 110kph/70mph, for 5-10 minutes based on a pilot’s throttle management. We prefer mid-throttle cruising for 7+ minutes of scale-style flying. The outboard motor pair and inboard motor pair are powered by separate flight batteries, allowing for powered landings in the event of one battery losing a cell. A 70mm tall nose wheel and 85mm tall main wheels provide stable operation on grass runways and split flaps aid in low speed flight and landings. Each model includes both the -D and -J nose in the box, and includes two decal sets comprising both waterslide and matte vinyl decals.